Programs are designed by our Education Department to enrich the elementary curriculum. 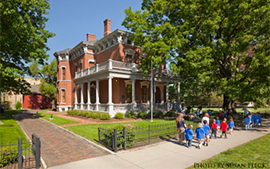 Each program brings a part of the Harrison family history alive for the students and includes a first floor tour of the home. A group must have 12 students or more to schedule a program. For smaller groups, a Presidential Site tour is recommended. Campaigning for the U.S. presidency once was an activity of subtlety and craft. Victorians participated in the political process in greater numbers than today. Why is civic participation still crucial to our political system? 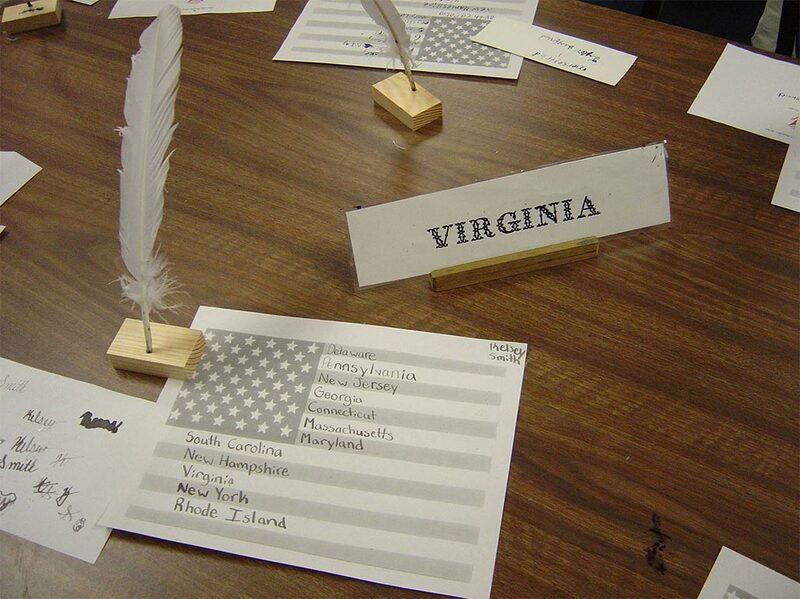 Students use Victorian techniques to support their favorite issues. William Henry Harrison, grandfather of Benjamin Harrison, was the first Governor of the Indiana Territory during its early settlement. 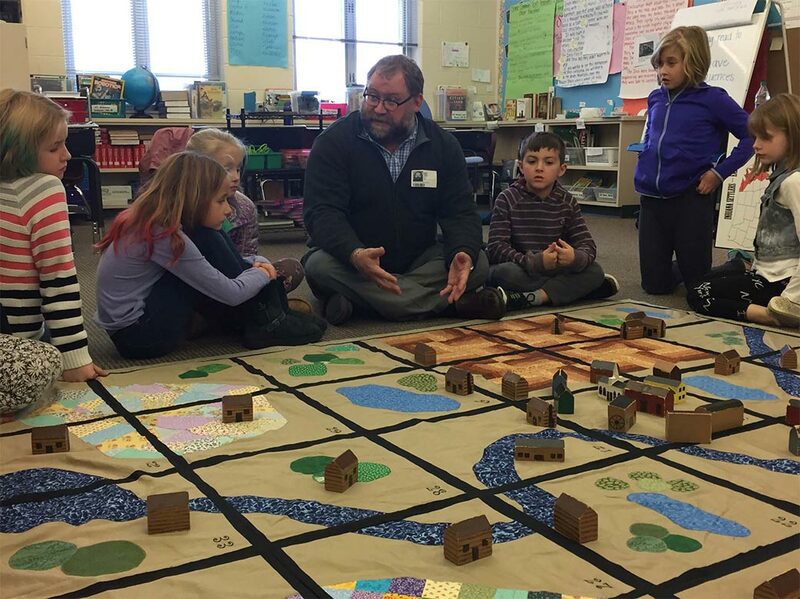 Using a colorful floor map, students learn how the pioneer settlers chose properties for businesses, schools and homes. 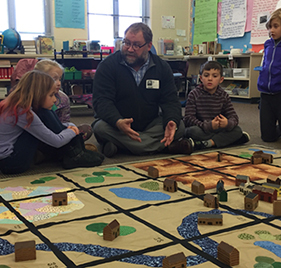 The role playing aspect of this program makes it popular among students and teachers. Since Benjamin Harrison was the first president to celebrate the holidays by decorating a tree in the White House, it is fitting that students see the home’s Victorian seasonal decorations. Harrison used wooden soldiers on his tree to honor those who served with him in the Civil War; each student makes a similar ornament. This program is offered only during the month of December. Benjamin Harrison’s grandfather, William Henry Harrison, the first Governor of the Indiana Territory, made treaties with the Shawnee Indians. Students discuss Shawnee culture, learn their alphabet and make headbands to take home. Benjamin Harrison V, great-grandfather of Benjamin Harrison, was one of the signers of The Declaration of Independence. 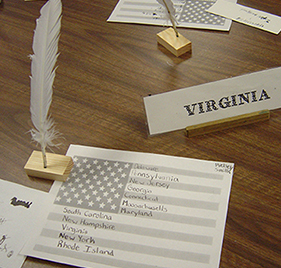 Students take a leap backward to 1776, become colonists, and sign The Declaration of Independence with quill pens, which they take home as reminders of their visit to the Presidential Site. The Pledge of Allegiance was written during Benjamin Harrison’s presidency in 1892, but what is a pledge and what makes this one so special? Students learn that a promise is more than a set of words; it is an intention to do something and a plan for the future. They also learn about the American flag as a symbol. 2nd grade 2.1.2 | 2.1.4 | 2.2.1 | 2.2.2 | 2.2.4 | 2.2.5 | 2.2.6. 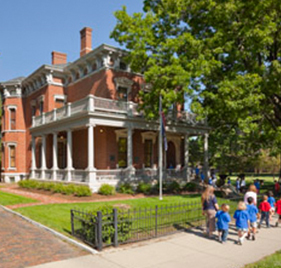 Children see Benjamin Harrison’s Victorian home through the eyes of a make-believe visitor, Minerva Mouse. Mark your calendar! The 3rd Thursday of the month is Homeschool Day. For more information, click here. Nothing can replace the awesome effect of bringing students into this crown jewel of Indianapolis, with 80 percent original artifacts! However, we know that not all local schools have the ability to visit the Presidential Site due to transportation issues or other concerns. Most of our programs can be brought to you as in-class activities. If interested, please contact VP of Education, Roger Hardig at rhardig@bhpsite.org or (317) 631-1888 for program availability and pricing, which varies depending on your location and needs.